Glenkinchie Distillery is sometimes referred to as "Edinburgh's distillery" and its product as "The Edinburgh Malt". This can be a little confusing as it stands in a very rural, even remote, setting, some 13 miles south east of Edinburgh and just over a mile south of Pencaitland. To the south the land rises steadily to form the Lammermuir Hills, and the distillery itself nestles in the bottom of the glen of the Kinchie Burn: hence the name Glenkinchie. The visitor car park is opposite the gates of the distillery (there is disabled parking closer to the visitor centre) and from there you walk along a path past a bowling green to the mainly brick built buildings of the distillery itself. Distilleries come in a range of shapes and sizes, and it is possible to place them on a scale that has picturesque pagoda-topped beauties at one end, and industrial units at the other. Glenkinchie Distillery will probably never be described as "pretty", but it certainly has character: and the rural surroundings and (in Spring) blossom-clad trees do provide a very nice frame for the buildings. The visitor centre at Glenkinchie Distillery is one of the very best you will find anywhere in Scotland. 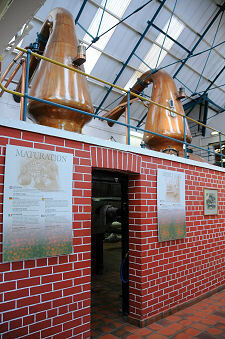 You enter into a reception area that doubles as the distillery shop, offering for sale the product of the distillery alongside whiskies produced by other distilleries owned by Diageo. From here steps or a lift take you through to the three exhibition rooms which form a central part of the experience of visiting the distillery, created from what were until 1968 Glenkinchie's malting floors: since then Glenkinchie, in common with most distilleries, uses barley malted elsewhere. The first exhibition area looks at the area around the distillery and the history of distilling, and includes Robert Burns' quote that until he came to East Lothian he had "never seen such fine corn country". The focal point of this part of the exhibition is a rather fine diminutive spherical still with a worm condenser and associated spirit receiver. The third part of the exhibition focuses more on the history of Glenkinchie itself, and also has the waiting area for the next distillery tour. It is the second part of the exhibition that you will remember, however. 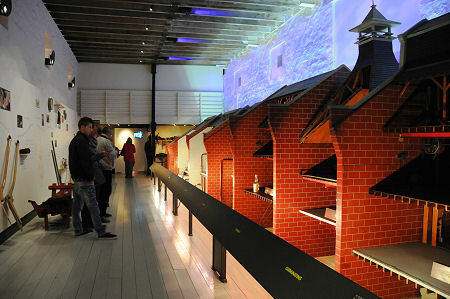 The whole length of one side of a long room is filled with an utterly magnificent scale model of an idealised distillery, with a section given over to each of the stages in the process. This model was commissioned by James Risk, a consultant employed by the distillery owners, and built in 1924 by the Northampton-based model making company Bassett-Lowke for the Scotch Whisky Exhibit in the Palace of Industry at the Empire Exhibition at Wembley. From 1926 to 1949 the model was on display at the Science Museum in London. It was then disassembled and put in boxes until 1963. It has been on display at Glenkinchie Distillery since the mid 1970s, and is worth travelling to see in its own right. Many sources say the model is one sixth scale. It is certainly huge, measuring some 15m in length and 2.5m in height, but the size of elements such as the stills suggest to us that the scale is rather smaller than one sixth. Your tour of the distillery starts with the kiln, disused since 1968. Glenkinchie was never home to the trademark pagodas which grace so many distilleries, instead it has the distinctive red and black chimney found at a few. Presumably the valley bottom setting meant that the smoke from the kiln needed a chimney rather than pagodas to clear the site properly. Still in action and your next port of call is the Porteus Mill, made at Richard Sizer in Hull. The production areas at Glenkinchie are generously sized, which means there is space to appreciate all the stages. It also means that elements often hidden away behind the scenes, such as the yeast tank, are in plain view. The heart of the mash house is the large stainless steel mash tun, and the operations are controlled from the splendid mash house control console standing against a wall. The mashtuns have their own separate area, and the Oregon pine of the mash tuns themselves is very pleasingly reflected in the wood cladding of the ceiling. Given that it seems such a large distillery, Glenkinchie's still room comes as something as a surprise. 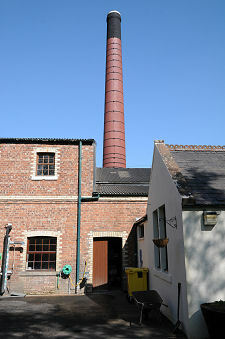 The room itself is large, but it is home to only a single pair of stills. 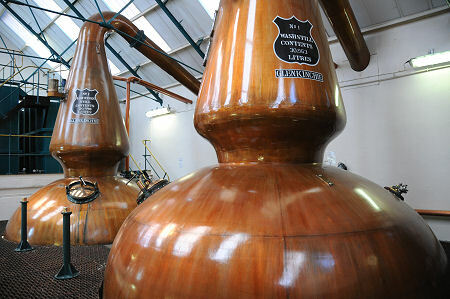 Having said that, at 30,963 litres, Glenkinchie's wash still is the largest in Scotland. The spirit safe is given pride of place towards one end of the still room, and if production is under way it is possible to see the clear spirit pouring through the safe. When we visited Glenkinchie it was not possible to visit the bonded warehouse, but plans were in place to add this atmospheric and memorable element of the process to the distillery tours. Either way, you finish your tour in the very nicely done tasting area, where you can sample Glenkinchie or a number of other single malt whiskies from distilleries owned by Diageo. Glenkinchie Distillery has origins dating back at least as far as 1837, when local farmers John and George Rate are recorded as holding a licence to distill whisky at what was known at the time as Glen Kinchie. They had operated the Milton or Millton Distillery in the area since 1825, and some have argued that Glen Kinchie was a rebuilding of the earlier distillery on the same site, or simply a rebranding of it: which would push back the origins of Glenkinchie by a further 12 years. John and George Rate ceased making whisky at Glenkinchie in 1853, though production was in full swing once more (and apparently had been for some time) when Glenkinchie was visited by the author Alfred Barnard during research for his definitive book on distilleries between 1885 and 1887. In 1914 Glenkinchie was one of five lowland distilleries to amalgamate to form Scottish Malt Distillers Ltd. Production across the industry ceased from 1917-19 to preserve barley for food, but the distillery otherwise continued to do well during the 1900s. As has already been mentioned the floor maltings closed in 1968, which gave the space needed for the very early distillery visitor centre that opened the following year. Today Glenkinchie receives some 25,000 visitors each year, and is a great half day out for anyone visiting the Edinburgh area. STB 5 Star Visitor Attraction.